I received this adorable children's Bible from Thomas Nelson to review. 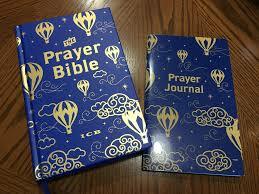 Printed in the ICB translation for kids to be able to understand, this Bible focuses on teaching kids about prayer. 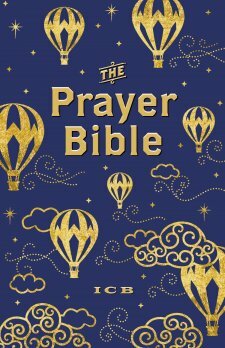 This Bible includes 160 pages of special prayer articles that highlight beloved prayers throughout the Bible. Also included are 64 color pages of poem prayers, praying the Scripture, and Q&A's from kids detailing the most asked questions about prayer. 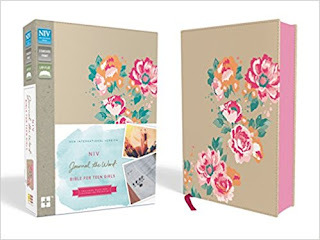 In my opinion, the most helpful tool included is this matching prayer journal, for kids to write out their prayers and document them, as well as for documenting anything they learn or any answers they receive. The Bible also includes pages for documenting prayer requests. The book itself is a sturdy, well-made hardcover. I just love the navy and gold cover designs. There is a blue ribbon inside for marking your page. I would highly recommend this for any kids looking for their first Bible. 5/5 stars. *I received a free copy of this book from the publisher in exchange for a review. I was not required to write a positive review. All opinions are my own. 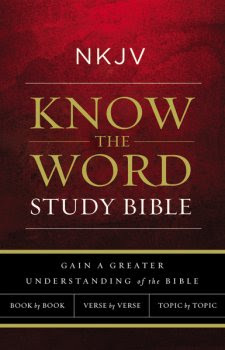 The goal of this study Bible from Thomas Nelson is to aid in understanding the Bible. Understanding meanings, events, and stories in the Bible is something that a lot of people often struggle with. This allows you to study the Bible in three different ways: Book by Book, Verse by Verse, and Topic by Topic. I received this as an e-book. and I didn't like it. I think the Bible itself is fine, I am just not a fan of the e-book version. It seems very disorganized and it is really hard to find anything. Flipping through the pages, I had no idea where I was half the time. I do think that this study Bible could be useful, but I would definitely recommend the physical copy for study. I'm sure the content itself is great, but to be honest, flipping through, I couldn't find anything I can talk about here to give you some examples. I really wish that I had the physical copy to compare it to, but I would have to give the e-book Bible 1/5 stars. 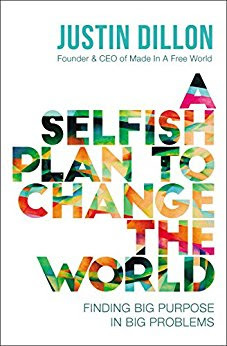 This book is all about using what means you have to change the world. Justin Dillon, founder of Slavery Footprint, argues that you don't need much to change the world, just your passion for a cause, and whatever resources may be available to you. Changing the world is for everyone. How to change the world...big question. Dillon suggests asking yourself: what bothers you? What do you think is broken? Finding these issues that really tug your heartstrings and make you angry is the starting point. Dillon states, "When you say, 'I wish someone would just fix it,' there's a good chance that person is you." As I mentioned before, Justin Dillon created slaveryfootprint.org, a website where you can find out how many slaves it takes to provide the things you use everyday. As much as we like to think that it is a thing of the past, slavery is still rampant today, and Dillon is working to stop it. I recently received a copy of the NIV Journal the Word Bible for teen girls from Zondervan, and OH MY WORD. This is the most beautiful Bible that I have ever seen! Probably the most beautiful Bible ever made! The cover is a lovely gold with a gorgeous floral design, and the pages have (eeee!!!) pink dusted edges! The one that I received has a soft but sturdy imitation leather cover. As you can see, the text is written in one column, and there is open, lined space on the side for journaling right inside of your Bible. Other than a subject index in the back, there are no study tools in this Bible. This is for teen girls to read and journal in as they go. I am completely in love with this Bible because OH MY GOODNESS is it beautiful!!! 5/5 stars without a doubt! *I received a free copy of this book from the publisher via the BookLook Bloggers review program. All opinions are my own.